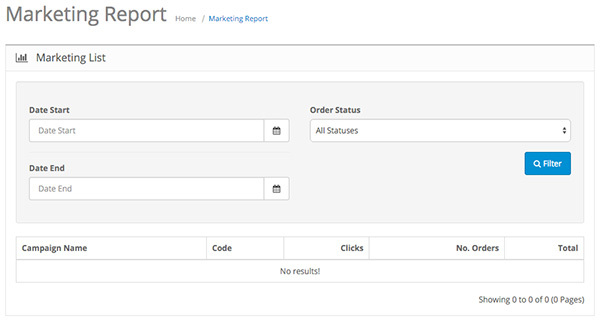 The Marketing Report can be accessed from Reports > Marketing > Marketing in the Admin panel. 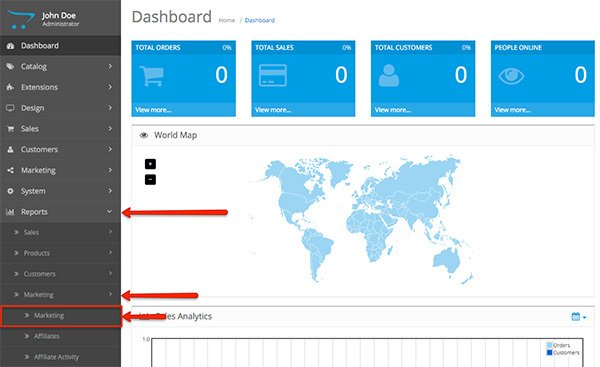 This report lets you keep track of the marketing campaigns that you have created. Date Start: The date that you have selected upon starting your marketing campaign. Date End: The date that marks the end of the marketing campaign. 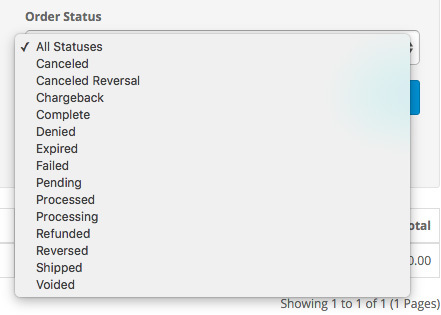 Order Status: The status of the orders that your marketing campaign has generated. Campaign Name: The name of your marketing campaign. Code: The tracking code that is displayed at the end of the URL of your marketing campaign. Clicks: The number of clicks that each marketing campaign has generated. No. Orders: The number of orders that your marketing campaign has generated. Total: The amount of revenue generated from the number of orders.